One is for the frum collector who doesn't want women on his wall. And I guess this is for the rest of us? Rabbi Meir Soloveitchik's invocation prayer at the RNC Convention this week. If Chabad doesn't try to stuff lots of feathers in their hats as it is, Meir went to Cheder Lubavitch in Chicago, and don't you forget that!!! He has fond memories of being off for a week from cheder during the ה' טבת festivities some 25 years ago. The comments and text in the player is how I got the clip. 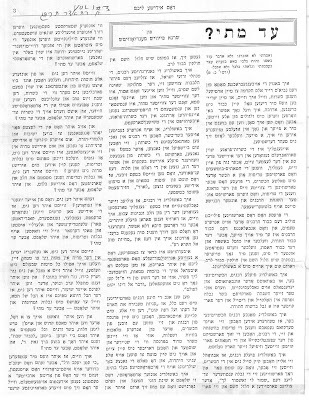 The letter that I copy and paste here was first shown on one of the many Yiddish forums out there. 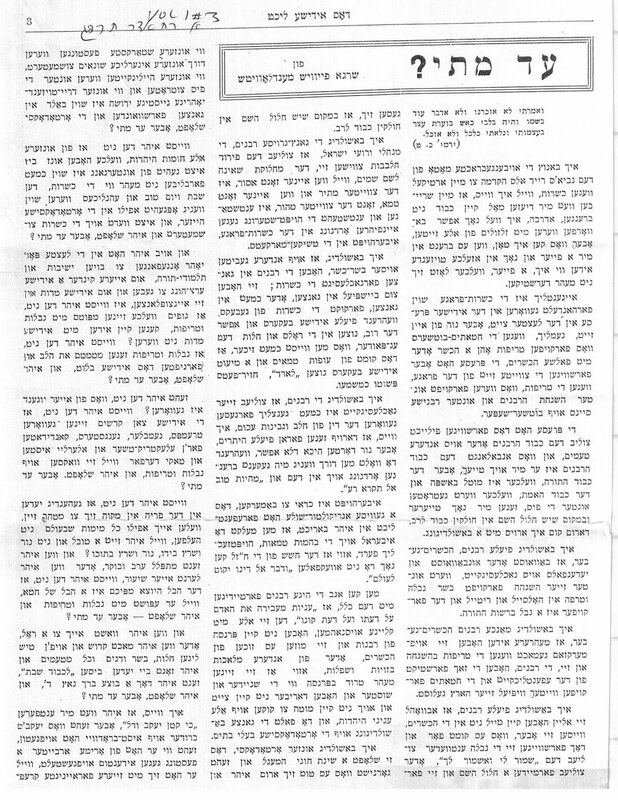 Most of the contributors and readers are of the Satmar persuasion, which would lead me to believe that one of them was the one to publicize this letter. What's even more interesting is that Satmar is known for its gashmiyus'dike help, not so much trying to influence you ideologically. And on top of that, today Satmar and Skulen are buddy-buddies. Maybe the Skulener was misinformed and was convinced otherwise once he came to the States. I have posted the letter without changing a single letter from the original. פאלגענד איז אן היסטארישער בריוו וואס כ"ק אדמו"ר מסקולען שליט"א האט געשריבן צו זיין נאנטער מקורב הרב צבי יוסף מיסקי ז"ל זייענדיג אין בעלגיע ווינטער תש"כ נאך וואס זיי האבן זוכה געווען צו ווערן אויסגעלייזט פון גלות ראמעניא, און עס איז דאן געווען פארשידענע פלענער וואו צו פארן, צו קיין ארץ ישראל אדער קיין אמעריקא. ווי עס קוקט אויס האט ר' צבי יוסף - וועלכער האט געוואוינט אין אמעריקא - געלייגט א שטארקע דריק אז מען זאל קומען קיין אמעריקא, און דאן האט דער סקולענער רבי שליט"א אים געשריבן דעם פאלגענדען בריוו. "אבער דאך ווייס איך ניט צו אמעריקא איז פאר אונז, מיר ווילן און מיר האפן זיך צו זען בקרוב מיט אייך, אבער אין תכלית ווייס איך ניט. די מאמע תחי' איז ניט געזונט, זי ליגט מיט ווייטאגן, עס ווייזט אויס דאס די קלימא שאדט איר. בעלגיע איז נישט גוט פאר רעומאטיזן און זי האט די איינציגע שוועסטער די מומע זלאטע אין ארץ ישראל, און אויך רייזל האט די עלטערן אין ארץ ישראל. דער מאמעס א נעפאט יעקב בן צבי מאשקאוויץ שרייבט מיר זאלן אונבאדינגט קומען קיין ארץ ישראל. ער האט אין בני ברק א ווילא מיט 5 צימער, גיבט ער דאס אונז און ער וויל אראנזירן מעבל יעצט. וועגן יעקב און צבי קלער איך אויך אפשר וואלט געווען פאר זיי מער תכלית אין ארץ ישראל. ר' אהרן גודמאן נ"י האט אונז איבערגעגעבן וואר דער סטומרער רבי שליט"א האט מיט אים אסך גערעדט וועגן טאטן, וועט דאך זיכער דער טאטע זיין ביי דעם סאטמרער רבי, קלער איך אז ער וועט זיכער מאכן א שמועס איבער די ענינים, זאל ניט חלילה ארויסקומען פון דעם קיין סכסוך. לויט ווי איך האב געהערט איז דער ראש הקהל מר יעקב שלמה נ"י שטיינפעלד אויך פון די מקורבים פון סטמרער רבי שליט"א, און אויך דאס קהל איז אויך סטמרער אנהיינגער, ווייס איך ניט צו דער טאטע שליט"א וועט קענען זיין מיט זיי צוזאמען. דער טאטע שליט"א האט זיכער ליב יעדן איד און יעדן רבי, אבער די סטמרער חסידים אז מען האלט ניט מיט זיי, קאנען זיי חלילה סיקירן. און דא אין אנטווערפען האט אונז אפגעווארט ביים אוויאן סיי די אגודת ישראל און אן עולם סטמרער חסידים. די סטמרער פארזארגן אצל דעם טאטן שליט"א מיט ספרים, ספר ויואל משה און דובב שפתי ישנים און פארזארגן אונז מיט צייטונגען פון די נטורי קרתא". 1. He brought chidushim from the American branch. The only guy with a hat and jacket on the whole time was a YESHIVISHE guy. Funny how times change. It's 90 degrees and he's oblivious to it. For hours. It's a farm. He's out with his kids, but he has the Ol even then. Plenty of chassidim there too, but nobody was like him. Reb Manis haCohen Friedman may not know this, but he has given hope to many, many of our Jewish brothers and sisters with this short promo. No longer must we be pressured during the חודש הרחמים והסליחות, which is named as such for a reason! It's a much more hopeful and positive message, and no doubt is a more correct way to serve the Holy One. Hashem wants you to come into his palace, and if you won't come on your own he'll go out to the field to get you to come in. He also gets his kicks in by contrasting the "Misnagdic" approach to the Chassidic one. All in good fun. 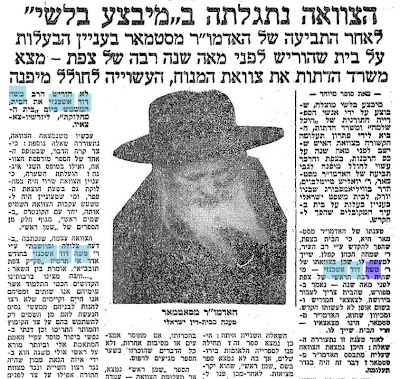 Rav Elyashiv was almost the גאב"ד עדה החרדית - - TWICE! Here too the baaleibatim interfered and did not let it happen. No matter how great the Rabbonim were at the time. 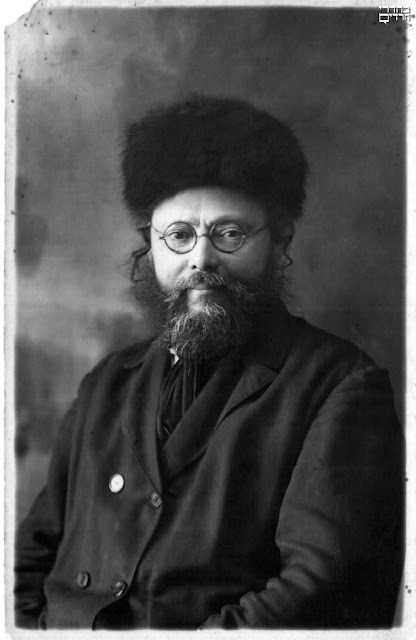 Rav Bengis, the "Minchas Yitzchok." It wasn't good enough. The laymen understood better. So we see that not only does this happen in the AI, but also in the holy of holiest, the עדה החרדית, did it happen - and still does! But in hindsight, imagine if that DID happen. דער מאמר האט ער אויך געהערט? UPDATE: We've been getting reports saying that it was NOT that wedding. Please stand by for possible changes. The Satmar Rov at a Lubavitcher Chasuna - well, half Lubavitch, anyway - in 1954 - כמדומני. 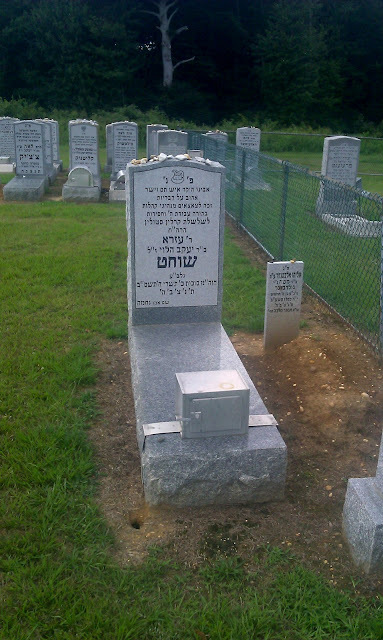 The Chosson was HaTomim Reb Meir Zajac, ZG"Z, a son of Reb Simcha Zajac from Brazil, who was sent there by the Frierdige Rebbe before WW2. 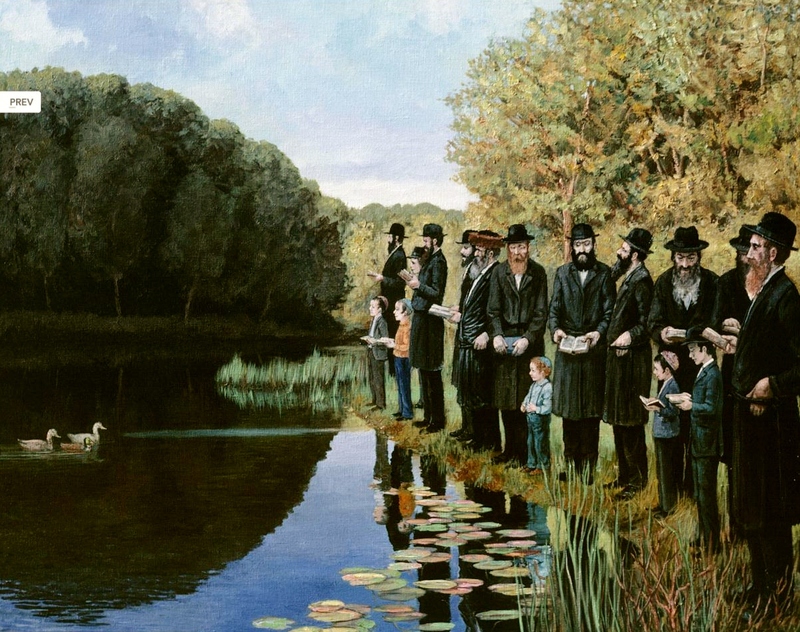 Meir and his brothers all came to New York to learn in Lubavitch. 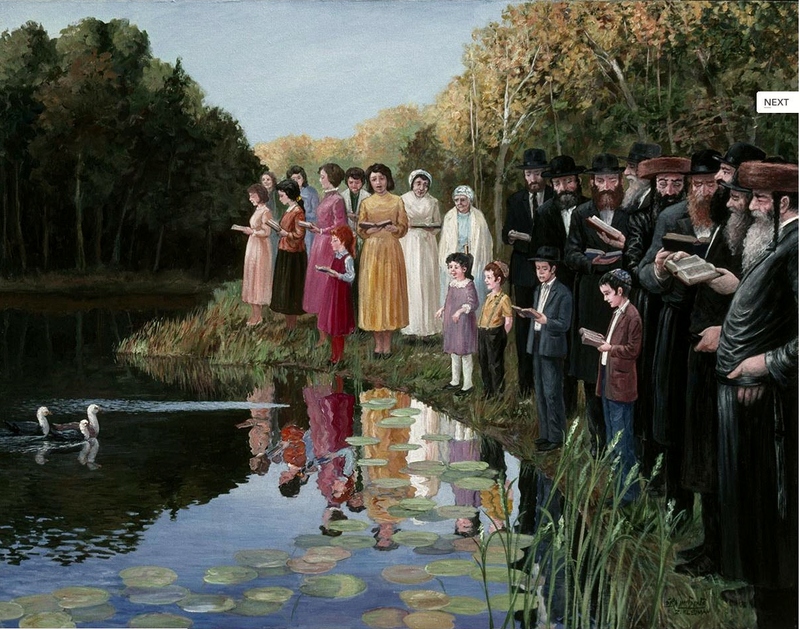 The Kallah was the daughter of a very staunch Satmarer Chossid, Reb Shloime Braver, ע"ה. Seated in the foreground are l-r: Reb Hirsh Kotlarsky, Reb Mordche Avrohom Yeshaya Groner and Reb Shmuel Levitin, as far as I can tell. 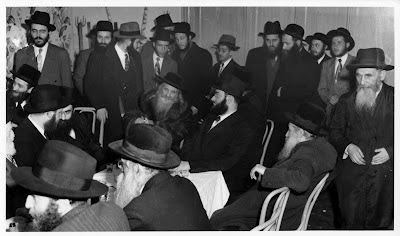 Behind the Rov stands the chosson's brother Reb Leibel Zajac, and seated in the background, second from left is the Rosh Yeshiva, Reb Mordche Mentlik, ע"ה. We also recognize Reb Yossel Ashkenazi before he switched to the more "Chassidishe beaver hat." 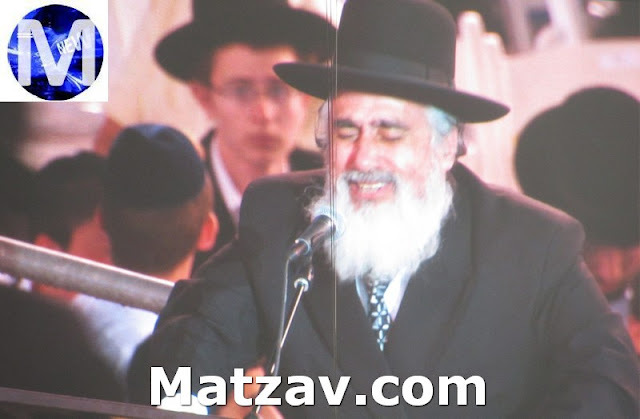 To Reb Yossel's left, with the gray suit and tie and black homburg is the mechutan Reb Shlomo Braver. Behind him, with the flat beaver hat, is a young Payer Ruv. Second from right, standing with the light suit, is Reb Chaim Alter Roth ע"ה, of Boro Park-נתניה, and standing on the extreme left is Reb Binyomin Williger שליט"א of Boro Park. The Chosson usually חזר'ט א מאמר חסידות at the קבלת פנים, which is why I asked what I did, whether or not the Rov was present at that time. I dare say that the מצב looks a bit uncomfortable there.... This is by no means a "new" picture - it's been out there for a very long time. 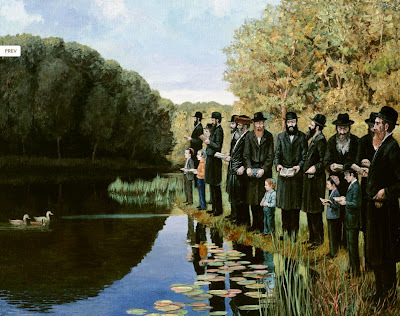 I just don't think anybody ever noticed the Lubavitcher element to the picture. Sent in by commenter Dos Yiddishe Licht. As usual click on the pictures to enlarge. 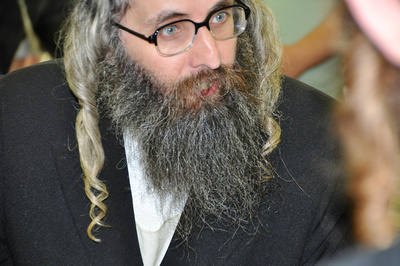 Reb Avrum Tzvi Kluger of the "נזר ישראל" Chaburah in Camp HASC. Click here to see where and what we spoke about RATK in the past on this blog. An interesting matzeivoh in the Jewish cemetery in Senta, the former Yugoslavia. Today it is Serbia, but it's an Hungarian town, with an 80% majority Hungarian inhabitants. 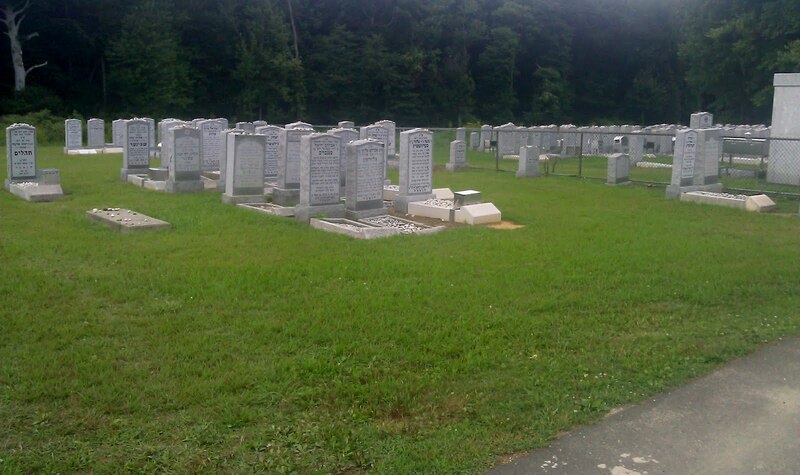 זענטא was made famous by the fact that the late Sighet-Satmar Rebbe, R' Moshe Teitelbaum, was Rov there. A friend of Circus Tent saw the matzeivoh, took the picture and shared it with us. 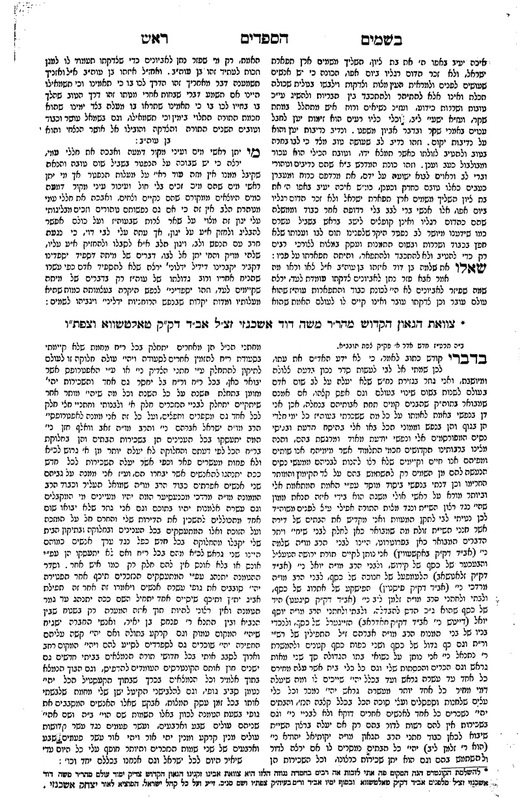 He was very intrigued by the fact that it mentioned that he did תשובה מאהבה and wanted more information on this Reb Moshe. This may prove to be a difficult task; There aren't many Zenter Yidden around today, especially not those who were alive and old enough in 1936. Although I did once have a neighbor, a Satmar Chossid by the name of Reb Aron Klein ע"ה, a שוחט , who was from זענטא. PLEASE E-MAIL ME IF YOU'D LIKE FOR ME TO SEND YOU THESE OR ANY OTHER PUBLICATIONS VIA E-MAIL. 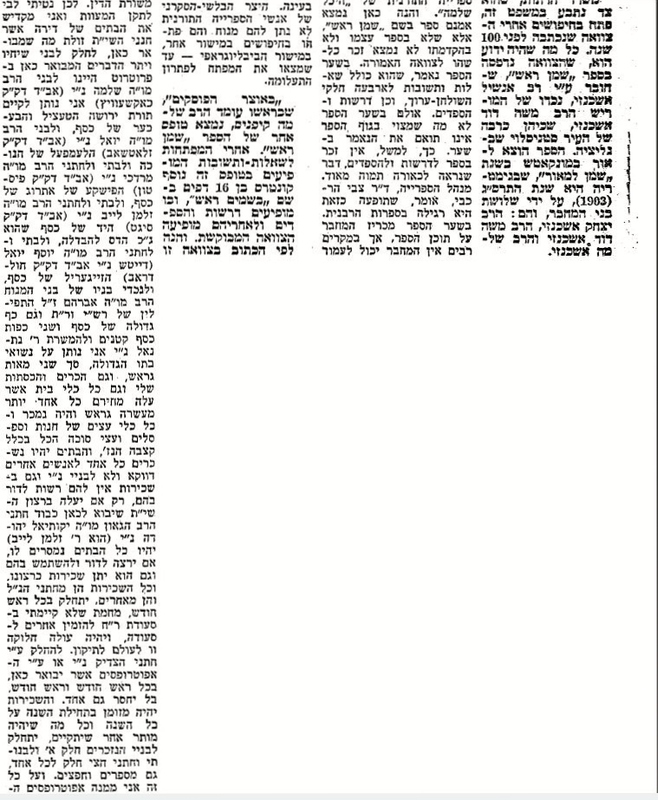 Look how the Satmar Rov's יארצייט makes so much headlines and how many tributes and booklets and blog postings are published! Even his detractors can't help but write about him every year! Here are two tributes/articles (whatever) that were recently published that you may have missed, or maybe don't really care for. The first one is דורות, the עדה החרדית weekly, which has a nice tribute. Typical, but still somewhat respectful of other streams. 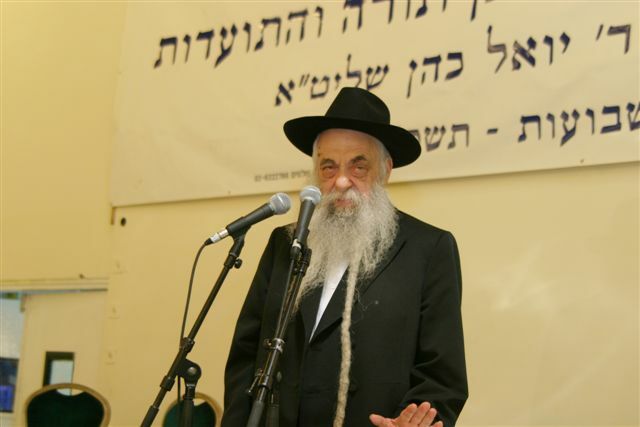 The Satmar Rov was the Rov in Yerushalayim מטעם העדה החרדית and the Nosi of the Edah for over 30 years. His successors as Satmar Rabbonim inherited that title - the Nosi part - as well. It helps with the fundraising. See the whole article here. 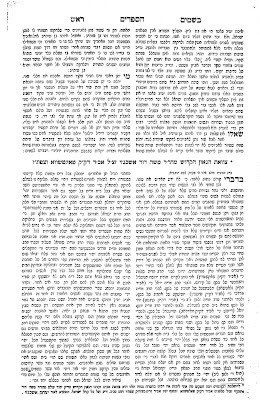 The next kuntres published may seem like it was a Satmar publication, but it looks like it was printed by the NK extremists who want to make the Satmoyrim look bad by using the most extreme expressions of the SR on groups like the Agudah and their leaders. This is NOT the "kinder, gentler" Satmar Rov that you read about in Hertz Frankel's articles or in Mishpacha magazine. No siree. It's full of לה"ר, רכילות, מוצש"ר and just plain lies about many of the previous generation's greatest leaders and thinkers, many of them said in a moment of rage or anger, all of them never should be published. If you want a rosey, lovey-dovey picture of the SR then don't read it. Read the whole booklet here at your own risk! מרובים צרכי עמך.... פאר פרנסה מעג מען אפילו פארקויפען לאקשן. כפשוטו. I'm not sure if this was Rabbi Wein's intention, namely to let the cat out of the bag and to tell us all that there REALLY is no difference between the OU and a "Heimishe Hechsher," but that's what he ultimately did. He tells us this in the name of the Satmar Rov, zt"l. But at the same time he justified the need for it, so that עמך ישראל can have פרנסה. Which is a truly noble cause, I suppose, even if it is a bit untruthful and insincere. After all, most people think that the ingredients are made in a 100% separate and kosher plant where no non-kosher products are produced. And that the people involved are all of the most noble and refined character. They also think that no leniences are employed - that everything that the holy Rabbi with the very W I D E brimmed hat is supervising is beyond the shadow of a doubt. Then again, Rabbi Wein was the head of the OU's kashrus division, so some salt should be used with what he says as well. 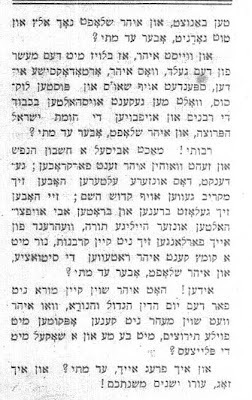 Having said that, we can learn much about the Satmar Rebbe's Ahavas Yisroel to Jews that he came in contact with, even if they were "diametrically opposed" to his weltanschauung. Which shows us that all we need is come together and discuss our differences, so that we can see how similar we really are. If not for the fact that the SR would visit Miami and that RBW would go and visit him, even if he thought that the former thought of him as a Zionist heretic; we never would have had these fine memoirs, and then how else would Ami fill their pages? נעכטן נאך מעריב, ד.ה. אור לכ"ז, שמועסנדיג מיט א סאטמארישע אידל האט ער מיר געזאגט אז לדעתו האט ר' בערל אינגאנצען נישט פארשטאנען דעם רב. אים האט ער געזאגט אז ער טוט עס נאר כדי אידן זאלען האבען דערפון פרנסה. אבער געמיינט האט ער אז באמת פארטרויט ער נישט די אנשי ה-אה יו די כופרים די ציונים די אפיקורסים, און דערפאר האט ער געוואלט אז ס'זאל זיין דערויף א "היימישן הכשר." קודם איז עס מיר שווער געווען אנצונעמען אזא סברה, אבער אזוי, אז איך האב עס א פאר מאל איבערגעטראכט, האב איך אנגעהויבן איינצוזעהן אז וואס ער זאגט איז יש דברים בגו. אויב אזוי קענען די אלע פון אייך וועלכע האבען נישט געוואלט גלייבן די מעשה ווייל עס איז מגלה סוד - קענט איר שלאפען רואיג. 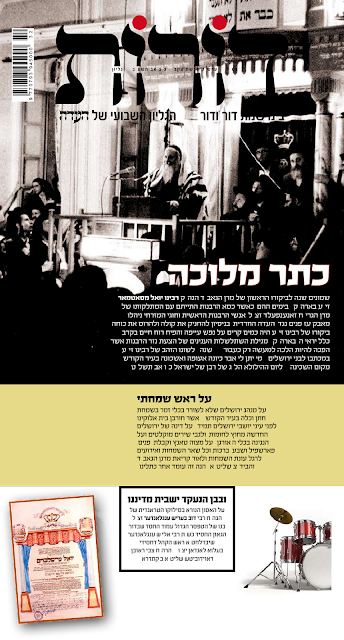 Then we have the story of the famous court case that took place in the 60's in Eretz Yisroel between two of the generation's greatest Rabbonim: the Satmar and Klausenberger Rebbes. They were both descendants of Reb Moshe Dovid of Toltshava, besides for the latter being the former's former nephew from the latter's first marriage, (by way of his son-in-law the Yetev Lev of Sighet, zt"l,) who left a house - which was claimed by both of them. 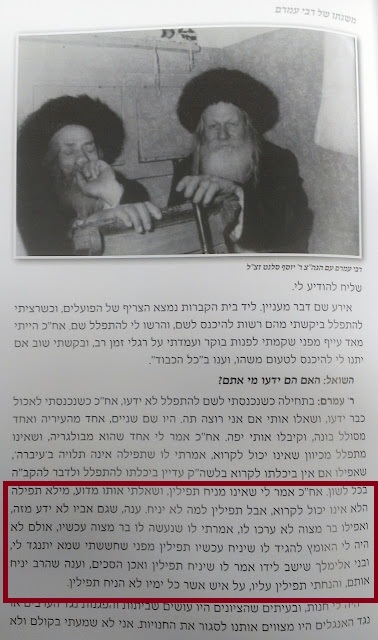 The house was turned into a הקדש by the Litvisher Rov of Tzfas, Reb Simcha Hacohen Kaplan, but the SR said that the Toltshever had explicitly said that the house NOT be turned into one, but that his descendants rent it out. The SR said that since he was a descendant of the TR he was claiming the house. 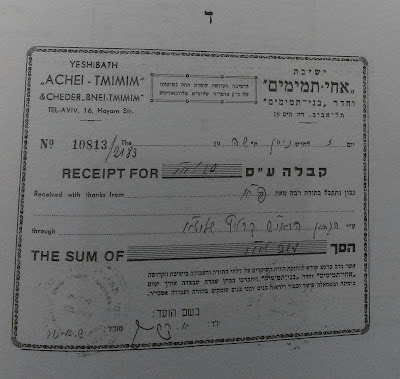 Without a copy of the will the court could not confirm it, so a "secret mission" to find the צוואה was initiated and the טריפה'נע היכל שלמה and Hebrew University libraries were used to help him in this case. Which is the part of the story/case that is reported here in this newspaper clipping. I have yet to find the story of the actual court case. That story - the story of how the great fighter of the Zionists used their courts when necessary - as do his 2 illustrious nephews today - that story needs to be told one day here. HaRav Ezra Binyomin Shochet is the Rosh Yeshiva of Yeshivas Or Elchonon Chabad in Los Angeles, Ca. He is an alumnus of Ner Yisroel, Lakewood's BMG and Yeshivas Brisk in Yerushalayim. Here he is seen speaking this past Motzoei Shabbos at the annual Yarchei Kallah at Camp Gan Yisroel in Parksville, NY. 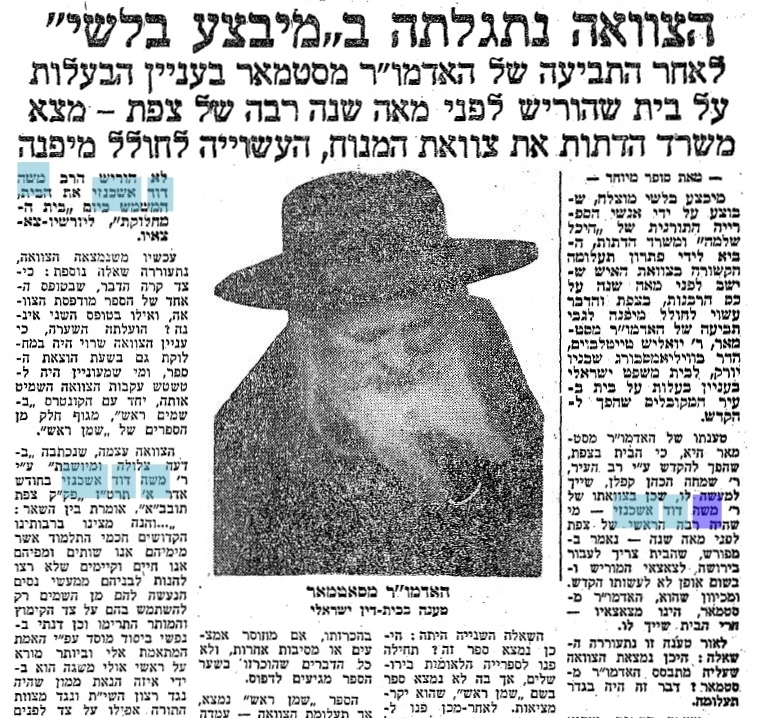 Rav Elyashiv's father was a "רב מטעם?" It seems not. In Russian Yiddish they called it a Kaziyaner Rov. It's funny that the blogger there was not dealing with that issue at all - maybe he overlooked it; He was dealing with the question of whether or not the Elyashivs changed their name only when they went up to Eretz Yisroel, and at the behest of the Chofetz Chaim. 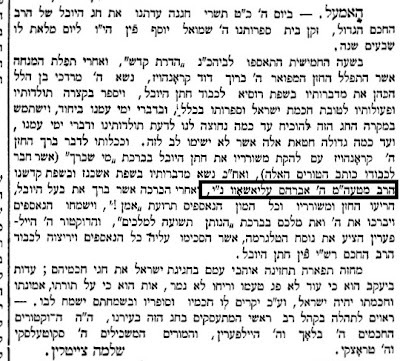 He brings this blurb in the Maskilic "המליץ" to prove that he had already taken his shver the בעל הלשם's name beforehand. 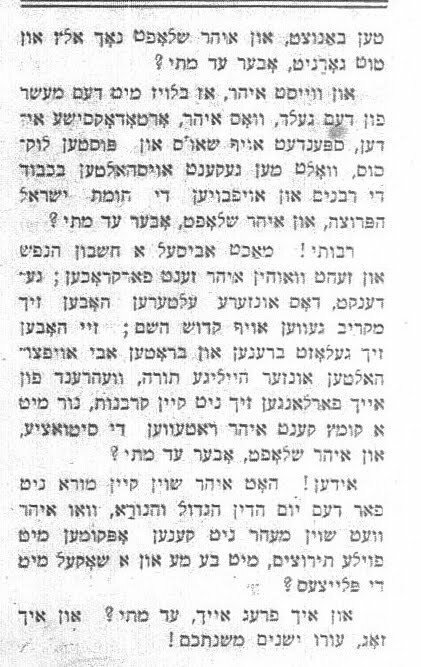 (speaking "שפת קדשנו" in 1889 is pretty "advanced" if you ask me.) But no, our source tells us that it was another man with the same name, that it was a different Reb Avrohom Elyashiv. A cousin or uncle, perhaps. That the Reb Avrohom who is pictured here was born in 1880 and could be only 9 years at the time of this article. 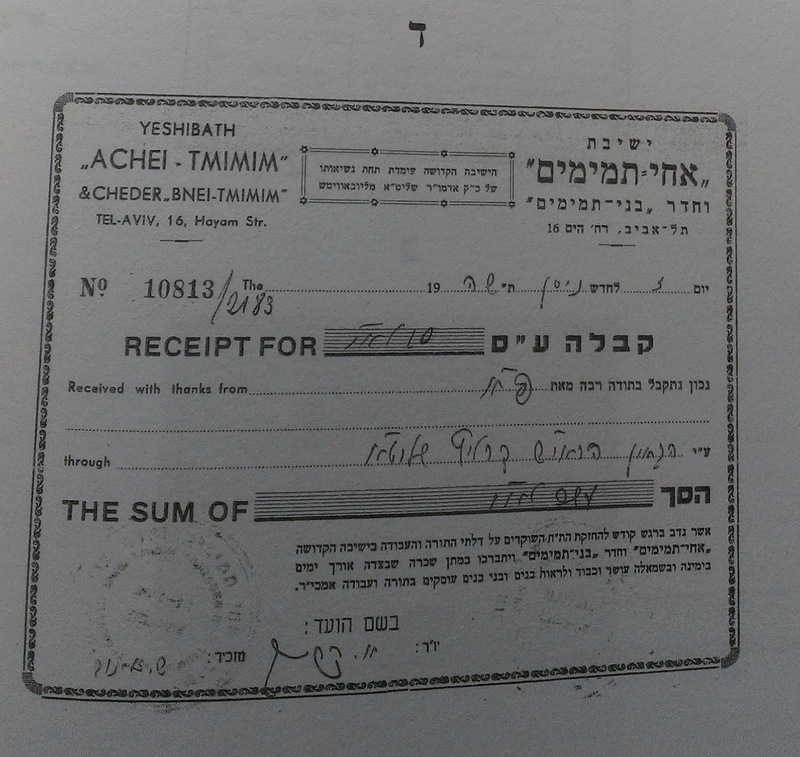 But was Rav Elyashiv's father also a רב מטעם? Even if he wasn't the one mentioned in the המליץ from תרמ"ט? Is it a coincidence that he was Rov in the same town as his relative? We need to get to the bottom of this. 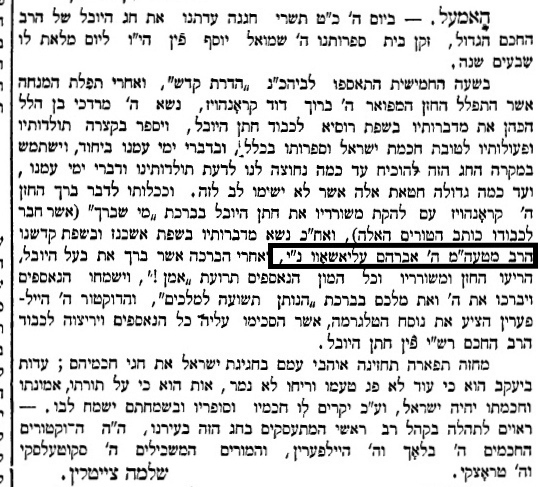 Another proof is a מזל טוב wish, also in המליץ, in תרנ"ט on the occasion of his marriage to Chaya Musha, daughter of Rav Shlomo Elyashiv (בעל הלשם). "רב מטעם" או "רב מטעם הממשלה" הוא כינוי שניתן לפקיד שמונה על ידי השלטונות ברוסיה הצארית החל משנות ה-40 של המאה ה-19 ועד ראשית המאה ה-20. תפקידו היה לשמש כרב רשמי של הקהילה היהודית וכנציגם מול הממשלה. עיקר אחריותו הייתה ניהול מרשם האוכלוסין של הקהילה (לידות, פטירות, נישואין וכו'). בדרך כלל נדרש "הרב מטעם" להיות בקי בשפת המדינה ובעל השכלה כללית. ידיעותיהם בענייני יהדות של המתמנים לתפקיד זה היו לעתים חסרות ובמקרים רבים כיהנו רבנים אחרים במקביל לרבנים הרשמיים מטעם הממשלה. בקהילות עניות שימש הרב לעתים גם כרופא וזאת על מנת לחסוך בהוצאות הקהילה. "צי האט איר געזען מיין ציג?" עפעס איז זי אונז נעלם געווארען לעצטנס. זי שרייבט ווען ס'לאזט זיך, כ'ווייס נישט צו ס'קען הייסן "געשריבן" בכלל. שרייבן הייסט מאכען א שטיקל מאמץ, זיך אנשטרענגן, זיך לאזען הערן. די ציג קלעבט בילדער, זאגט אפ א פאר ווערטער, און ווערט ווידער פארשווינדען. אמאל איז ער אויף וואקאנס, און אמאל איז שבת.יו"ט. י"ט כסלו. וויפיל איז די שיעור מאטערן זיך און זעהן צו ס'איז דא נייע מילך? מיר דארפען אפיר נעמען די ציג און איין מאל פאר אלעמאל מאנען וואס קומט אונז - פרישע קאלטע מילך מדי יום ביומו. פרייטאג, מוצאי שבת און זונטאג אויך. ערב שבת איז נישט קיין תירוץ. אויב קען זי נישט פארטראגען די היץ זאל זי מוחל זיין און ארויסגיין פון קיך. 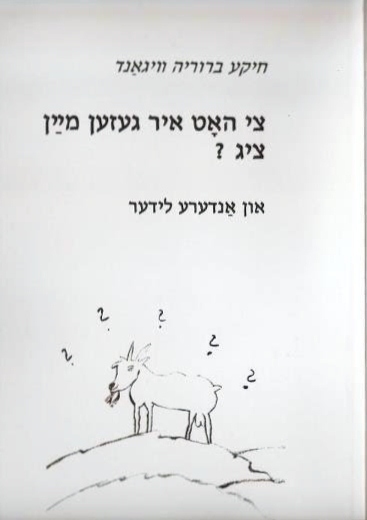 from the sefer "גנזים ושו"ת חזון איש"
I was away, sorry if comments weren't moderated properly. These are some of the small things we accomplish. A fine בן תורה was made aware of תורת חסידות חב"ד through the blog. He might have otherwise never have known the geshmak of a perek Tanya or a parsha in Likutei Torah, and yes, Likutei Sichos as well. If only more of us would do that...Why do I brag here? 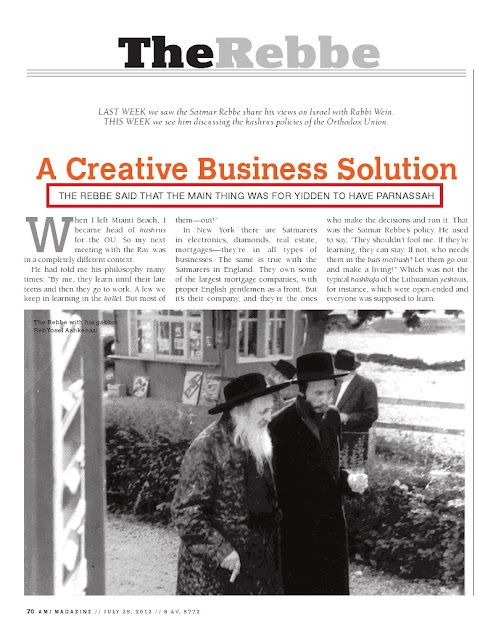 simply because I often times get flack from Lubavitchers who tell me how I'm actually hurting "the cause" by writing. That may be the case sometimes, but the positives out weigh the negatives- I think. There are also countless email conversations and questions that I get and respond to, which you don't know about. All in all people see me as sensible and fair, even if we disagree. So I'd say that the opposite was true, that more often than not we accomplish good things. Rabbi Hecht's untimely - so to speak - passing on this day in 5750 shocked us all. See how he tells the story of he was saved from the draft during WW2 by a brochoh from the Frierdige Rebbe of Lubavitch. He also goes on to say that by extension every other Rabbi in the USA was thus exempt... And yes, you guys who know who you are can get in your daily fill of Lubavitch bashing by listening to the last 2 minutes of his speech here, which pertains to the story of ה' טבת. What a fiery speaker! They say that הכל הולך אחר הסיום.... I'm sure we can make exceptions to the rule. If you try hard enough you can erase that from your memory. Eli Fink loved the event. I too was very inspired. I danced like at a friend's wedding. I learned that I don't suffer from ADD and can sit through 6 hours of anything without getting up from my seat. If you closed your eyes and banished all the evil and impure and אומפארגינעדיגע thoughts in your mind you could be inspired. Which is what I did. 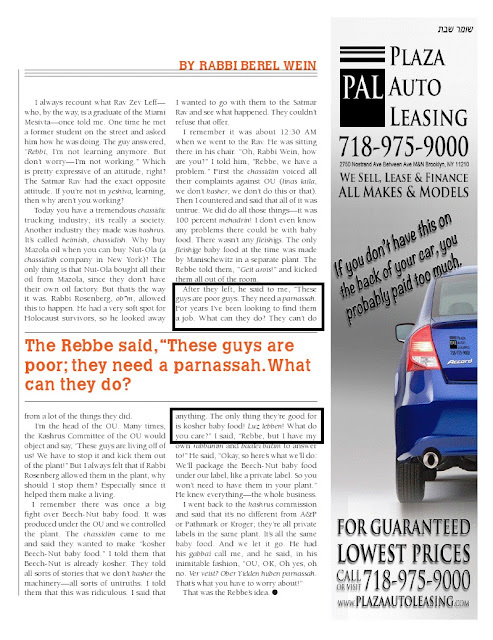 But to their credit the Agudah did keep the kudos to themselves to a very bare minimum! Will I begin to "do the daf?" Maybe. Maybe Rabbi Frand - who looked like he was rehearsing in the mirror - inspired me as well, even if he was a paid speaker. I suppose they could've done without the Novominsker and Reb Shmuel K - but I'm not in charge. Reb Shmuel looks to me a little lost. The dancing was VERY nice. A VERY strong message was sent to the zealots when they gave Rabbi Lau a VERY strong and loud round of applause. I think the fact that he (and Rabbi Frand) didn't get a "HaRav" next to his name says something, no? Why didn't he get it? Is he less Rov then a Rosh Yeshiva? But at the same time the fact that the Chassidisher Oylam was not well-represented on the dais shows us how in the Chassidishe Velt the kanoyim have won. 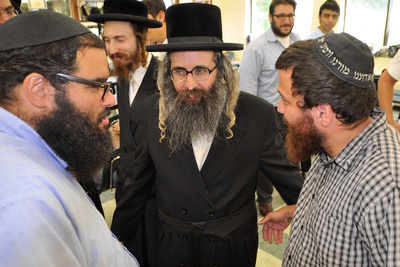 Everybody wants to be on Satmar's good side, unless you're Ger, Belz or Klausenberg. No Skulener Rebbe, no Vizhnitzer Rebbe, no Skverrer Rebbe. די סקווערע רבי איז געווען וואו, פונקטליך? I'm sure they had prior commitments to attend to... No Pupa either. Imagine if they would. Pretty impressive to pull that crowd together without the aforementioned groups. Oh, and Lubavitch too. The Klausenebrger Rebbe said it well when he referenced the פסוק of מים רבים לא יוכלו לכבות את האהבה. It takes a Chassidisher Rebbe to think of that. And best of all - NO mention of Dirshu! THANK YOU!!! א טרונק וואסער וואלט מען געקענט דערלאנגען..... People sat there for hours on end, they paid good money for their tickets, would it kill you to spend another $100k on water? maybe a bag of pretzels and a danish like they had in Citifield? Get some Chassidim in there doing the real organization of the event next time. I mean no disrespect to Reb Lazer Ginsberg, but it was just too much. Maybe he should've switched with the Mincha Baal Tefillah. is this a good seat? It's the original resting place of the Rebbe, Reb Yochanan of Lutsk/Karlin-Stolin, youngest son of the Rebbe, Reb Yisroel of Stolin, זצ"ל. This is the Stoliner Celkah in the Washington Cemetery in South Brunswick, NJ. A.K.A. Deans. 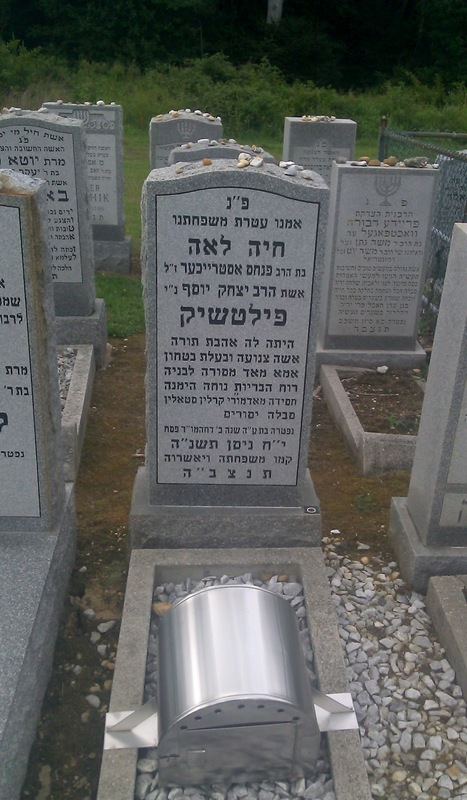 Reb Yochonon was buried there "al tnei" after his passing in 5716, and a year or so later was moved to Tverya, Israel. There are lots of stories about that - maybe for another time. חדב"נ ר' עזרא שוחט, father of the Karlin-Stoliner Rebbe. Interesting choice of words on the מצבה. I assume the Stoliner Rebbe authored it. The מצבה is off to the side, in deference, I suppose.